The name that guarantees thoroughness, care with detail, and experience. We take pride that when we renovate a piano we attend to everything that is wrong, but in addition we also have experience to know what may later require attention of a kind which would mean earlier work would be wasted. We will never agree to undertake partial renovation because this in the long term is wasteful of clients' money. When our clients get their piano back it looks and sounds as good as or better than it was when new. Piano owners should be vigilant in seeking repair and renovation work. To repair a piano properly requires skill, patience, dedication to excellence, resources and facilities, knowledge of piano design and above all integrity not to cut corners. Most pianos over 60 years old will be prone to progressive failure of the wrest plank (the wood block into which the tuning pins go). With the right equipment and knowledge replacement is not a difficult job, but it is beyond the competence of all but a handful of repairers in the UK. They will bodge the job by using oversize pins or apply useless chemicals to lock the pins. After such treatment economically viable repair of the piano is rarely an option. 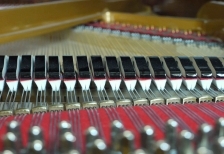 Older pianos usually suffer collapse of the dome (crown) of the sound board and/ or fracture of the joints in the sound board and micro cracking of the bridge cap. To re-string a piano without attending to these matters is total waste of money. It is not uncommon to find plastic wood filler covered with a liberal layer of varnish in a cracked soundboard to disguise the fact this work has not been done. The message is that if you intend to have your piano renovated, be certain you have appointed the right person to carry out all the necessary work whether it shows or not. To rely on the name of the restorer is not always a safeguard, even when it is done in the original builder's own repair shop. There is much more to renovating a piano than polishing and cleaning the case and fitting bright new strings. 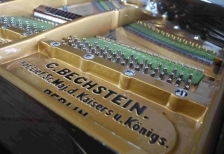 Generally it is only possible to justify total renovation of selected models of premier makes such as Bosendorfer (except those with Vienna action, and Model 213), Steinway models O, B, and D, some larger Bechsteins and Bluthner prior to 1940 . Most other makes and models cost more to renovate than the value of the finished instrument. There are however exceptions and it is important to take advice before scrapping any piano. 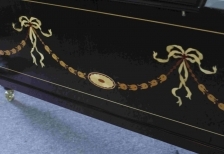 Historical pianos or those of sentimental value may also be lovingly restored. The age of the piano is not critical. Quality, well designed instruments of 100 years old and more can be restored to look and sound as they were when new. Some professionally restored craftsman built old pianos we consider significantly better than their modern new factory mass produced counterparts. Full renovation of a grand piano to as new condition takes about three months. On completion of restoration the piano will need the same attention as a new instrument in terms of regulation and stabilisation tuning. New strings need time under tension before the metal crystal structure develops to give long term tuning stability. The photos show pianos recently restored by us - some over 100 years old. They now sound and feel wonderful to play. They were destined for the scrap heap when we gave them reprieve. In addition to full renovation we can arrange to veneer pianos in any chosen wood finish. Within bounds we can also alter case styling and add monographs or other special features. As well as full renovation we undertake hammer replacement, hammer re-shaping, keyboard and action repair. After such work the action will need key levelling, re-weighting, and facing of the new hammers to the strings. The latter operations are time consuming but vital work which many technicians "overlook" because the average client will be unable to make visual check it has been done. If it is not done the piano will feel "lumpy" and have uneven response.